Apologies for the late posting today – I’m on holiday and haven’t had a chance to post until now. It was immediately recognised as a primate by everyone, which is unsurprising, given the very characteristic enclosed bony orbits and set of four incisors in the premaxilla and mandible. The teeth were also commented upon by henstridgesj, who recognised that this is an Old World Monkey (Cercopithecidae), with two premolars on each side in both the maxilla and mandible. Some people might argue with the classification of this specimen as a member of the Cercopithecidae, since the lack of a tail suggests that it’s an Ape of some sort, but the Hominoidea form a smaller clade within the wider Cercopithecidae clade, which means that this is both an Ape and an Old World Monkey. There are 16 species of Gibbon in four genera – without a more complete image of the specimen, a better sense of scale and some better photos it’s a bit tricky to get the identification to species level. 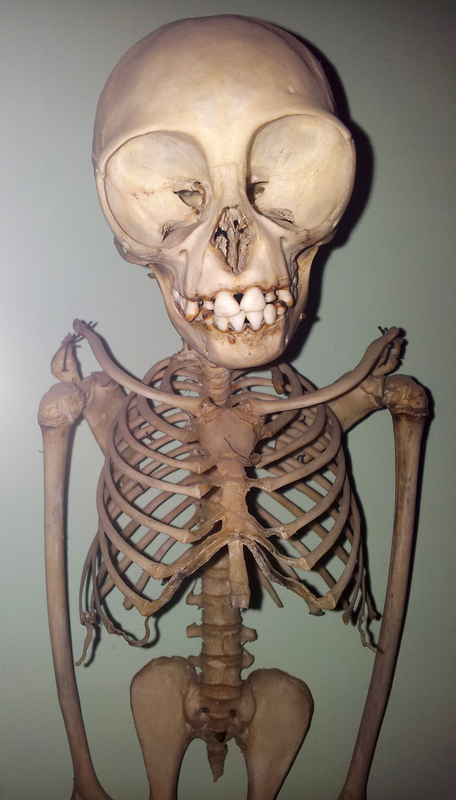 I can however tell you that this is the skeleton of a Grey Gibbon Hylobates muelleri Martin, 1841. These energetic Apes from Borneo are almost entirely arboreal, relying on their insanely long arms to swing (or brachiate) between branches. Their large eyes aren’t an adaptation to nocturnal behaviour, rather they allow good vision in the shadowy area beneath the canopy of the tropical forest in which these animals live. So this Friday could be a Flanders & Swann reference – my guess is either a gnu or a sloth.